SSC has already official announced the CGL 2013 Tier-I re-exam date on 27th April. The re-exam will be conducted in 7 selective cities only. Check here for the list of 7 cities. Now it is important to see what will happen on 17th April's hearing on SSC CGL 2013 exam. Will CGL 2013 re-exam be held on 27th April? Can SSC conduct re-exam on their earlier announced-date? We will publish about it on our next article. Keep in touch with us to get latest news update on SSC CGL 2013 exam. 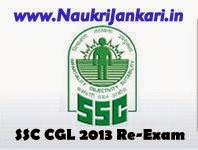 0 comments for " SSC CGL 2013 exam: New Hearing Date on 17th April "